Prog-fusion keyboardist Derek Sherinian has a new album on the way entitled Molecular Heinosity. As is always the case with Sherinian's albums, he has an impressive lineup of guests on the disc. Guitarists Zakk Wylde, Brett Garsed, Rusty Cooley, and Taka Minamino all make appearances, along with bassists Tony Franklin and Jimmy Johnson, and drummers Virgil Donati and Brian Tichy. Check out Sherinian's MySpace page for sound clips. 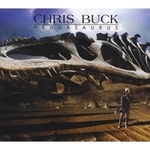 LA-based session musician Chris Buck has brought together some of the biggest names in prog-fusion for his new album Progasaurus (Early Boy Records). A largely vocal album (there is one instrumental), Progasaurus has elements that will appeal to both old-school and new-school progressive rock fans. One look at the album's personnel should give you a clue about what you are in for - Derek Sherinian (Planet X, Billy Idol) plays keyboards, the drumming duties are split between Virgil Donati (Planet X, Devil's Slingshot, CAB) and Brian Tichy (Derek Sherinian, Billy Idol), and Brett Garsed (Uncle Moe's Space Ranch, Dirty Martini, Planet X) plays guitar on every track except "Kanines," which features Allan Holdsworth. Buck wrote the majority of the tracks (there is one cover), handles all bass and vocals, and plays some rhythm guitar. One would assume a strong Planet X-vibe would be present on Progasaurus, given the musicians Buck has enlisted here. There's certainly some truth to that, but Buck's writing and vocals is the X-factor (so to speak) that keeps the album from being a Planet X clone. As a vocalist, Buck has a definite Brad Delp-meets-Steve Walsh quality. This, coupled with his writing style, adds a certain classic rock/'70s prog flavor to the proceedings. Buck is also a great bass player, but surprisingly he only takes two solos on the album. Songwriting is obviously Buck's main focus on this project, but after hearing his great slap-solo on the album's second track "Imprint," I was hoping his bass work would be more prominently-featured than it ultimately is. That said, this is a prog-rock album after all, and as such there are some pretty complex parts in these songs for every instrument, including the bass. Stylistically, Progasaurus features lots of heavy doubled riffs, odd time signatures, and crazy solos. In other words, this material is right up Derek Sherinian's alley. His contributions have a huge impact here. The solos he takes on the final two tracks, "Progasaurus," and "Inside/Outside," are particularly impressive. Donati and Tichy turn in great performances as well, especially on the odd time stuff. Also, this album is further proof that Brett Garsed is one of the top guitarists on the rock/fusion scene today. One of Garsed's great strengths is his chameleon-like ability to fit in perfectly in any musical situation. For example - compare and contrast his subtle slide work on the ballad "La Mere En Douler," with his complex lines on "Imprint," or his bluesy inflections on the straight-up rocker "The Gator." Who else but Garsed could wear all these hats so convincingly? To me, his range as a player is at least as impressive as his signature hybrid-picking technique. Garsed stands out on numerous other songs as well, including "Inside/Outside," the instrumental title track, and the Jimi Hendrix cover "Up From The Skies." Another player on Progasaurus that is sure to generate some interest is, of course, Allan Holdsworth. "Kanines" is the only track the legendary guitarist appears on, but any output from this icon is a welcome treat, and he does not disappoint here. Holdsworth takes two great solos on this tune - first, in the very interesting main solo section over alternating segments of 7/4 and 5/4, and again at the end over the song's primary 4/4 groove. As always, his tone is gorgeous, his phrases are strong, and his fast runs are baffling. Buck definitely knows what he's doing when it come to writing this type of material. While any prog fan would enjoy these songs, regardless of who was playing on them, the fact that Progasaurus features such an impressive group of musicians really sweetens the pot.